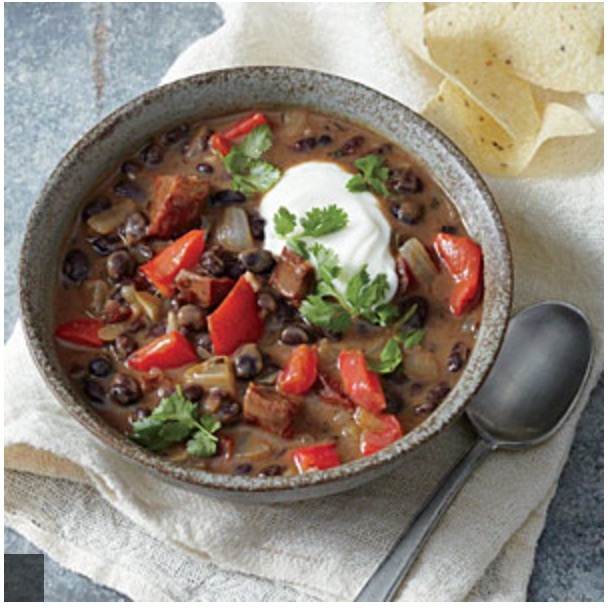 Soak 2 cups of black beans in a bowl over night. They will swell and you will be able to see if there are any that need throwing out. In the morning rinse and drain. You soaked the beans the night before so they are swollen and ready to boil for some time (If you have a pressure cooker, it needs about an hour in A LOT of water. If boiling in a large pot, this may take a couple of hours until beans are soft and cracking open – again, lots of water) … pour a glass of wine, get a good book or your latest blog post in front of you and just check now and then to make sure you haven’t run out of water. Heat a large saucepan over medium heat. Add 1-teaspoon oil to pan; swirl to coat. Add chorizo; cook 3 minutes, stirring occasionally. Remove chorizo from pan (do not wipe pan). Add remaining 1-teaspoon oil to pan; swirl to coat. Add onion and bell pepper; cook 3 minutes, stirring occasionally. Stir in oregano, garlic, cumin and chilli. Cook briefly. In the mean time cook up some healthy brown rice. Stir in stock and add beans and chorizo. Bring to boil; reduce heat, and simmer for 20 minutes so that flavours mix together. Dish up rice into bowls, ladle bean soup; top off each serving with a dollop of sour cream/crème fraiche and 1 tablespoon coriander.